First, a confession: I have these urges to create beautiful, interesting things that have no practical purpose. Not very strong urges, unfortunately, so very little creating actually gets done, but they did lure me to the colorful, tactile, chameleonic medium of polymer clay. Puritan work ethic and the need for something like a reliable paycheck (ha!) keep me from spending hours squeezing, sculpting, rolling, layering, cutting, impressing, etc., so to keep my muse from starving to death I steal a few minutes a day to read PC-related blogs and forums. Often I’m blown away by what more motivated artists have accomplished with the medium, from figural sculpture to imaginative vessels to jewelry and other wearable/functional art. Sure, not everyone who gets their hands on PC can take it beyond the Play-Doh stage, but I’m in awe of those who do. One of my regular reads is Susan Lomuto’s Polymer Clay Notes. Like any good artist, Susan is constantly searching for inspiration in other media, and she shares some of her finds with her readers. Normally I appreciate how her choices broaden my horizons, but today’s entry, crudely embellished Necco wafers, gave me flashbacks to college. This is the sort of thing my art professors would swoon over, while I’d just roll my eyes and mutter, “The emperor has no clothes.” It’s just doodles on candy, for Pete’s sake–the only thing that makes it high art is the pretentiousness of the doodler and the gullibility of her admirers. Good thing my major was biology–I’d never have made it as a “real” artist. Interest in the 5th Annual Adams County Amish Bird Symposium is heating up! I’ll be sharing the podium with coordinator Chris Bedel; Robert Schlabach, a member of the Holmes County Amish Community; Ivory-bill hunter Dr. Geoff Hill of Auburn University; bird photographer Brian Zweibel; and naturalist/illustrator Jen Brumfield. The cost is $20 per person age 13 and older; children 12 and under are free. Be sure to include the attendees’ names, mailing address, day and evening phone, e-mail address, and meal preference (meat or vegetarian). HOT RODS: Fact or Fiction? It’s interesting that so many rod-related Web pages and images, including almost all of “Rod Man” Jose Escamilla’s site, are no longer available. Could it be that The History Channel came along a few years too late to milk this phenomenon to the max? Thankfully, people are still coming to LB&E for the “B” content. The unexpectedly hot topic in that category is the Wisconsin Green-breasted Mango (previous entries 1, 2, 3, 4). I’m not sure what’s behind the sudden resurgence of interest in this disgraceful chain of events, which ended with the poor bird permanently incarcerated at the Brookfield Zoo. There’s no longer any hope of winning him his freedom and a free ticket to Texas, so the best we can hope for is to prevent this, or something even worse, from happening to the next vagrant bird that’s not (yet) covered by the Migratory Bird Treaty Act. I’ll be posting more about this later, so please stay tuned. 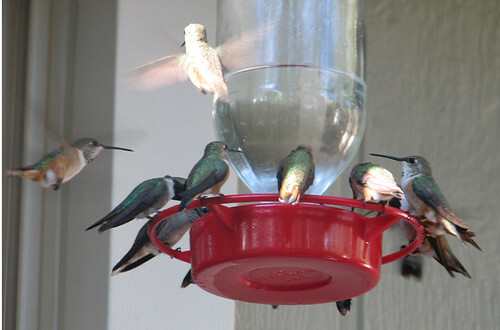 I just ran across a post from last August on The Fat Finch Bird Brain Blog that addresses the frequently asked question about how to calculate the numbers of hummingbirds visiting your feeders. The bloggers based their formula on a book that they absolutely gush over, Hummingbirds of North America by Dan True. True is a meteorologist by profession and was the weatherman for an Amarillo, Texas TV station when my husband Tom was growing up there. Tom has fond memories of True rushing through his weathercast to have time to show his amateur wildlife films. The actual statement from True’s book is: “Hummingbirds eat an amount of 25% content nectar that is equal to their body weight, daily (Skutch 1973).” The source cited is Alexander Skutch’s Life of the Hummingbird, which I no longer have in my library and so can’t check to be sure the number was cited correctly (the clumsy sentence structure suggests it’s not a direct quote). This is a pretty sweeping generalization to start with, and whoever came up with this figure miscalculated by a pretty large margin. Studies of field metabolic rates (the average rate at which an organism consumes energy as it goes about its daily life) indicate that small hummingbirds such as Black-chinned and Ruby-throated are going to need 45% to 50% of their body weight in sucrose (a.k.a. white sugar, the dominant sugar in the nectar of hummingbird flowers) to get through an ordinary day, so they would actually need 180% to 200% of their weight in a 25% sucrose solution. A 25% solution is much stronger than most people use in their feeders. The generally recommended proportion is 1 part table sugar to 4 parts water by volume, which comes out to about 18% sugar by weight. Converting to this recipe, it would take approximately 250% to 280% of the bird’s weight in ordinary 1:4 feeder solution to meet each bird’s daily energy requirements. So, how do you use these data to estimate numbers of feeder visitors? The simplest way is to convert grams to fluid ounces so that you can measure the volume consumed (you can even mark your feeder and estimate usage on the fly). According to my postal scale, one fluid ounce of 1:4 sugar water weighs about 35.5 grams (approximately 20% more than its plain water counterpart). We’ll average the weight of the birds to 3.5 grams, or about 10% of the weight of a fluid ounce. Multiply that times by 265% for average consumption and we get 0.265 fluid ounce of 1:4 feeder solution per bird per day, which we’ll round down to 1/4 fluid ounce per bird per day. This multiplies out to around 32 smallish hummingbirds per 8 ounces of 1:4 sugar water, 128 per quart, and 512 per gallon. This is higher than the TFFBBB estimate, which is not surprising considering the differences between our figures for weight and consumption rates of the birds and weight/volume ratio of the sugar solution. Of course, there are a lot of factors that can skew this already crude estimate. The amount of sugar water each bird consumes may be greatly reduced when natural nectar sources are available and greatly increased when the birds are under stress from cold, drought, courtship, fighting, nesting, and/or migration. A given volume will supply the needs of more birds if you make your feeder solution a little stronger than 1:4, as many people (myself included) do in winter and migration, and fewer if you make it a little weaker. Size figures in as well, so a given volume of sugar water will feed fewer Anna’s than Black-chinneds. The late William A. Calder III Stephen M. Russell, professor emeritus at the University of Arizona and the world’s authority on Rufous and Broad-tailed co-author of the Birds of North America life history account on Black-chinned Hummingbird, estimated that a gallon of sugar water would feed about 750 Black-chinneds for a day. Based on published field metabolic rates, this number would be quite high unless you are a) using a ratio of sugar to water much higher than usual for feeders (almost 28%) or b) assuming that the birds are getting a significant fraction of their calories from other sources. I wish I knew how Bill Steve arrived at this figure, but since I don’t I’ll stick with the more conservative figures I derived from the metabolic studies. Fellow hummingbird researchers Nancy Newfield and Bob and Martha Sargent have suggested a method for estimating hummingbird numbers that has nothing to do with sugar consumption. They recommend counting the number you can see at one time and multiplying this number by six. The nice folks at Bird Watcher’s Digest used this method to estimate their population of Ruby-throateds, but they also kept track of their sugar-water usage. Based on a half gallon of feeder solution per day, I’d estimate that they’re feeding over 250 hummingbirds, not the 139 they estimated by counting and multiplying. Of course this method would never work at really busy feeders like the ones at the home of my friends Bruce and Sue in Arizona’s White Mountains (below), but it’s one more approach to a challenging question. One additional nitpick about the TFFBBB entry: It assumes that Ruby-throated Hummingbirds migrate south across the Gulf of Mexico when the evidence strongly suggests that the majority take an overland route around the Gulf in fall migration. They didn’t get this from Dan True, whose book thoroughly documents his skepticism about trans-Gulf migration in either direction (he’s apparently unaware of the many Ruby-throateds that take refuge on offshore oil rigs and fishing boats each spring, along with other trans-Gulf migrants, or eyewitness accounts of them skimming the waves on approach to coastlines). This week’s episode of The History Channel’s cryptozoology series MonsterQuest, “Creatures from the 4th Dimension,” pretty much met my expectations, which were admittedly basement level. The subject was “rods,” hypothetical flying organisms supposedly invisible to the naked eye but frequently captured on video. I first became aware of the wild speculation about rods (a.k.a. “flying rods,” “skyfish,” etc.) in the 1990s when a videographer announced finding unusual unidentified flying objects in video footage of base jumpers plummeting into Mexico’s Sótano de las Golondrinas (Cave of the Swallows, actually an enormous sinkhole). Any reasonable person with a basic understanding of photography would look at the images and say, “Wow, there sure were a lot of insects flying around the cave that day.” UFO buff Jose Escamilla had captured similar images and interpreted them as a previously unknown life form capable of supersonic speed and/or interdimensional phase-shifting. So much for Ockham’s Razor. This phenomenon has already been thoroughly debunked as videographic distortion of flying insects and other fast-moving, out-of-focus objects, but MQ was obviously going to milk the “mystery” for as many ratings points as possible. Milk it they did, from interviews with self-described “Rod Man” Escamilla to largely unsuccessful wind-tunnel tests of model rods at Iowa State University. One of the funniest segments was a TV news cameraman’s story of noticing a “rod” while reviewing tape of a tornado in progress. He interpreted a tiny bright streak of light as a huge object traveling at enormous speed into the storm. (To me, it looked like a small insect or wind-blown debris passing through a beam of light.) The idea that something would deliberately fly into such a storm freaked him out, and he managed to spread this hysteria to other station personnel. The incident climaxed with the station manager’s call to the FBI and confiscation of the tape by federal agents (Men In Black, one imagines) as possible evidence of a threat to national security. Naturally, the feds had no comment on the incident, either out of embarrassment at wasting taxpayer money or to avoid tipping the government’s hand in the search for Arthropoda bin Laden. The saddest segment, as well as the one of most interest to me, covered MQ’s investigation of the reasonable explanation that at least some “rods” are out-of-focus birds in flight. The producers recruited a birder and an ornithologist to help them capture images of a hummingbird using a normal video camera and a high-speed camera mounted side by side. Much to the birder’s embarrassment, her feeding station was deserted thanks to an accipiter that had been hanging around. The intrepid MQ crew soldiered on, making do with video of her and the ornithologist speculating that hummingbirds would be the birds most likely to be a source of rod phenomena but noting that their exclusively Western Hemisphere distribution precludes them as an explanation for the Chinese video the producers were using as an example. They also noted that the images in the video looked more like insects than birds of any sort. In its last few minutes, the program finally got around to taking the dual-camera setup to a likely location for insects. It was at night, and they had to literally beat the bushes, but once the bugs took flight the normal camera captured perfect images of “rods.” On the high-speed camera, one particularly classic image was revealed to be… a moth. Case closed? Of course not. Escamilla dismisses the debunkers by saying that he’s presented only the “visual evidence,” so the skeptics are not basing their analysis on all of the data. Well, where’s the rest? If there’s more compelling evidence than the easily-explained video images, why not put it out there for the scientific community to examine? Obviously, people have a huge appetite for such nonsense, and the format (a dramatic buildup followed by a low-key debunking) guarantees an audience among both the gullible and skeptical (they lured me in, didn’t they?). It’s too bad that The History Channel is so desperate for ratings that it’s willing to run sensationalistic fluff with so little connection to its other programming. But back to the bird connection for a moment. MonsterQuest also includes an episode on reports of gigantic birds in which the evidence includes footage of an obvious Turkey Vulture. The sheer number of reported sightings of animals that shouldn’t exist or at least shouldn’t be where they were reported demonstrates the all-too-human desire to apply extraordinary explanations to ordinary phenomena. Naturally, this carries over to birding. Haven’t we all tried at one time or another to make a poorly seen and/or unusually plumaged bird into something rarer than it actually was? To paraphrase the immortal Harry Nilsson, sometimes we see what we want to see, and we hear what we want to hear. I regularly field inquiries from people who believe they’ve seen unusual hummingbirds, but some are more unusual than others. The typical description is of something noticeably smaller than a run-of-the-mill hummingbird but behaving exactly as a hummingbird does. Some believe that they’ve seen “baby hummingbirds,” while others have read or heard about the Bee and/or Bumblebee hummingbirds and interpret the names a bit too literally (neither of these birds is as small as its insect namesake) . Sometimes a report comes from outside this hemisphere, where hummingbirds don’t exist in the wild (at least not in the last few million years). This familiar scenario strayed even closer to cryptozoology last year when I received a forwarded request for help in finding a photo of a particular kind of hummingbird. The person making the inquiry had rescued a hummingbird in western Montana years before and wanted a photo of such a bird as a memento of the event. She described it as “as red as a cardinal” and had already rejected the possibility of Rufous Hummingbird. I assured her that the adult male Rufous was the only logical candidate given her description as well as the area in question, and that no hummingbird anywhere in the world is the same shade of red as a cardinal. True, even the occasional new hummingbird, but these discoveries take place in remote tropical wildernesses, not in Montana. A bright red migratory bird with an attraction to garden flowers and feeders would have a vanishingly small chance of escaping notice for two centuries in such a well-studied corner of North America. It’s a similar problem with giant birds, Sasquatch, and the Loch Ness Monster and its kin. Even the “black panthers” reported in the U.S. and Canada are mostly domestic cats whose dark color makes them appear larger, not escaped exotic cats or near-mythical melanistic Mountain Lions. I suppose it does no harm for someone to believe that she held an unknown species of hummingbird in her hand, as long as she doesn’t make a cult out of it, but it’s always a letdown when even the most persuasive evidence fails to convince.